Are you ready to prepare for a new homeschool year? What's the first step you take? Usually, it's sifting through that pile of homeschool catalogs sitting on your shelf. Or maybe it's asking what other homeschool families will be using. Maybe you're not too sure about your teaching abilities for a certain subject so you buy 2 or 3 programs to cover one subject. But there is a better way to begin the process of planning for a successful homeschool year. The first step - deciding on the most important goals for each child. 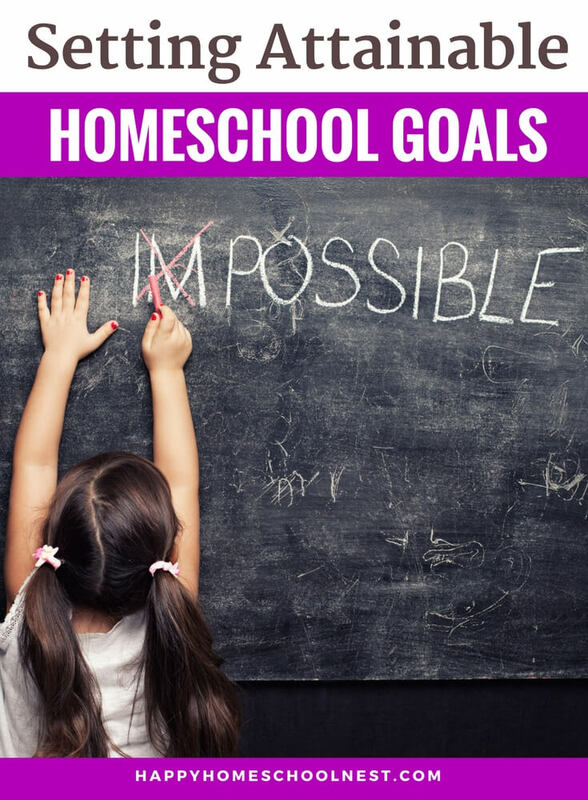 Let's learn how to set homeschooling goals. Goal-setting is an important step in the process of building your homeschool. Appropriate goals will give you a clear direction during each homeschool year and help simplify the process of choosing appropriate courses and curriculum purchases. Most of all, solid goals give you the ability to change course when unexpected life events interrupt your carefully-planned schedule. On the other hand, if you choose to forego setting any yearly goals for your homeschool, you can run into difficulty. Without a clear plan, you could easily over-schedule, filling your homeschool day with too many subjects and books -- which can lead to burnout for you and your children. When you don’t have a clear direction, it’s easy to flounder and lose focus, as well as begin the dreaded “curriculum hop,” as you fall into the habit of looking for that “perfect” curriculum. For mathematics, students progress by learning number sense, then move on to addition, followed by subtraction, before progressing to multiplication and division. Upper-level mathematics follows a particular sequence as well, making it easy to track progress and achievement. Language arts (English) encompasses a variety of skill subjects that also fit within a natural progression. These subjects include reading, spelling, writing, vocabulary (word study), and grammar. Each skill is independent but also interwoven with the other skills. When you look at each skill subject as a natural progression of skills and achievements, as well as how they fit within the larger framework (especially language arts skills), it’s much easier to set realistic and attainable goals. Skills build on each other each year and provide the backbone for a solid education. Instead of planning to just finish a math text or grammar workbook each year, make goals for your child that encompass the progressive achievement in each of these skill subjects. Setting these yearly goals can give you a clear sense of direction and help you avoid becoming a slave to the curriculum. You can confidently discern when your child has a strong grasp of a particular skill and might find that it isn’t necessary to complete every problem or lesson in a workbook. Or you may discover the opposite -- that they need a little more work than the program provides, and so you find additional resources to fill in those gaps. But if you don’t have a clear understanding of where you are going, it’s easier to fall into the trap of overcompensating and doing too much, which causes burnout and boredom. Want to dive a little deeper into goal setting? Click below to find out more about Homeschool DIY — your guide to creating the happy homeschool that fits YOUR family. Now that you know how to set homeschooling goals, here's a look at the homeschool goals we've set over the years - with one caveat. These were our overarching goals for the year - we don't necessarily work on these things every day. They are just the baseline that we follow throughout the year. Lots of time spent outdoors, nature walks, observation, etc. Our goals for first grade were quite similar to kindergarten. We continued to progress with language arts and mathematics and started our first history 'cycle'. Our second grade goals are still quite similar to previous years - continuing to work on basic educational skills and moving on to the second year in our history 'cycle'. Third grade is following the same pattern set down in first and second grade. We're continuing to work on basic educational skills, adding in more grammar and writing, and moving on to the third year in our history 'cycle'. We're also working on adding a bit of independence to our day with science. Fourth grade continues to build on skills learned in previous years. I'm focusing on more independence, quick recall for math facts, using cursive penmanship in all subjects, and writing across the curriculum. 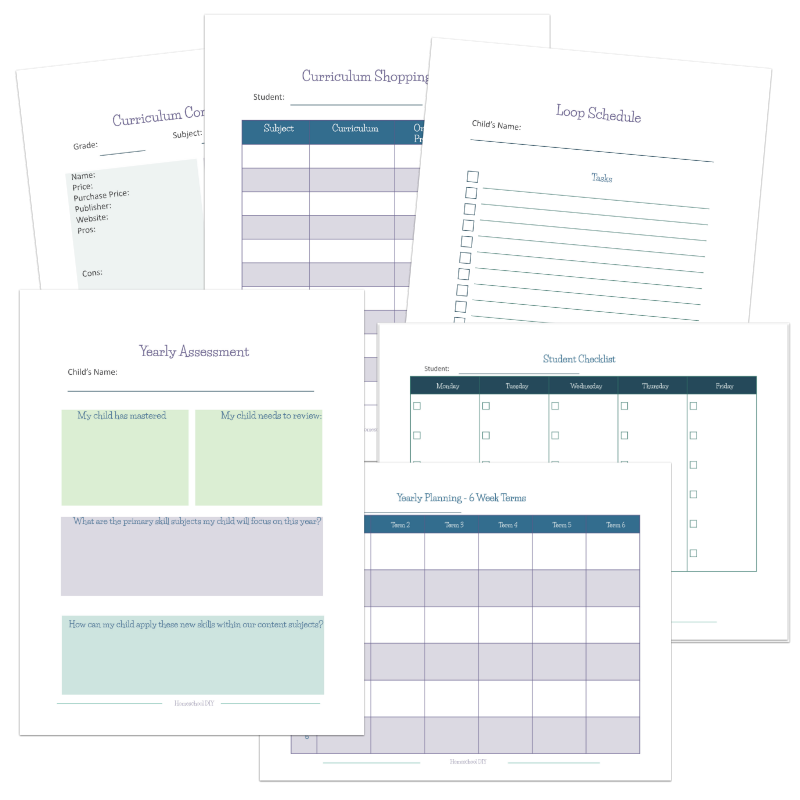 Click below to join the community & learn how to make your own homeschool nest a happy place -- and get these free homeschool planning pages (including some goal setting forms). My homeschooling goals have made a dramatic shift this year. We've been in a 'must check it off the list and get on with real life' mode and it's not what I originally intended for our homeschool. I want to create an atmosphere of peace and learning instead of rushing through things or just doing them to get them checked off. I've been listening to many podcasts and youtube videos from Circe and Dr. Perrin and the ideas that they discuss have really struck a chord with me. These videos - Scholé, Contemplation & Leisure and Teaching from a State of Rest - speak to the ideals that I envision for our school and it has caused me to rethink our homeschool day and how we have been doing things. So this year will bring many changes to our schedule and goals. 5th grade also brings its own changes - more independence, discussion, writing & research skills... all the things that I want to add to our day. The biggest change will be with our schedule. To change the focus of our day from moving through a checklist to spending time delving deep and discussing many topics, we'll be having a daily morning meeting time. Content subjects will also be changing. Instead of trying to rush through history and science each week, we are focusing on one thing in the afternoons. 3 weeks of history, interspersed with 2 weeks of science and 1 week of independent study. By spending more time focused on one topic each week we can delve deeply into the topic without feeling rushed to check things off a checklist. I'm hoping that moving away from the 'to-do list' mentality our school day will be more relaxed. We'll still cover lots of other subjects, but these are the things that I'd like to pay particular attention to. TJ already has specific ideas about how and when she likes to do things but she's still lacking in following instructions and it's very easy for her to dawdle away her time. So, while she thinks she's ready for complete independence, I know that there are a few things that she really needs to work on before she's ready to take the reins completely. My goal (for this year and next) is to slowly transition her to just checking in with me in the morning before she starts school and in the afternoon when she finishes. There will be a few subjects that we'll still work on together, but for the most part, she's ready for more independence. These later middle school years are starting to bring more changes - TJ works more independently but still needs supervision. As far as schoolwork - we're focusing on math (making sure she knows everything she needs before starting high school math), research and writing skills - and applying them to her history, science, and literature assignments. With high school looming on the horizon, we're continuing to work on building independence. We're shifting from a daily morning meeting to a beginning of week meeting and an end of week meeting. On Monday, we go over her schedule for the week, and she writes her assignments in her agenda, deciding for herself when each assignment will be completed. During the week, she works independently and, on Friday, we go over her work for the week - correcting assignments and discussing her reading and writing. It feels like such a change - only being needed twice a week! Skills we're working on - taking notes from a textbook, research skills (online and encyclopedia), writing literary essays and other writing assignments.